32 oz Tumbler is rated 4.3 out of 5 by 73. Rated 5 out of 5 by Tres from Sooo dope! I love everything about this Hydro! Cute color, holds beverage temp for like-EVER. Cleaning is a breeze and I love the lid options. Highly recommend!!!! Rated 5 out of 5 by Cobra from Love the features This Hydro Flask caries a lot of fuel on a long drive and keeps it warm until the last drop! Love the new lilac color too! Rated 5 out of 5 by Mckenzie from Fits in a cup holder I absolutely love hydro flasks... between my husband and I... we have about 12 and my parents have like 8! We love the colors and different sizes for different outings! We just have my son a 22oz tumbler with straw lid and he loves it! We are hydro flasks fans for life! Rated 5 out of 5 by Cmb2477 from Love our hydroflasks We currently have 9 hydroflasks in our family of 4. I’m not sure how we lived without them for so long. They are our go to for anything. We use them to hydrate when we’re traveling, at the gym or need some hot coffee for cold days. Several family members have even bought them and love them as well. The only thing I would change is making some more with handles for older people who tend to drop things or are unable to hold the wide sizes. Rated 5 out of 5 by Mp62 from Love everything I use these tumblers daily! They keep everything cold forever. If I leave it out over night I still have an ice cold drink in the morning. I bought the lid with the built in straw, it’s fantastic. Soft, flexible and totally easy to clean. Rated 5 out of 5 by Nothing from Great I bought it a month ago love it. Recommend it to everyone. Rated 5 out of 5 by BrandonB from More cold drinks Works as well as my 22oz tumbler, just more goodness inside. 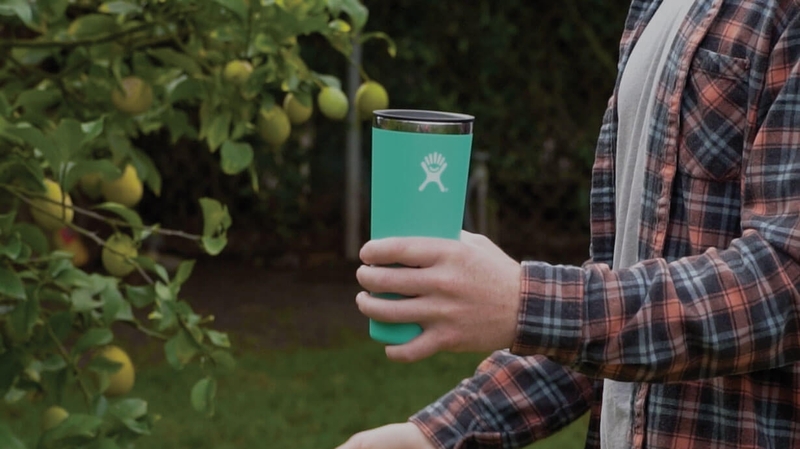 Wish HydroFlask would bring back the Mango color though.. Rated 5 out of 5 by cpa18 from Beautiful & functional I love the new frost color, and it's so easy to clean! Rated 5 out of 5 by AshLee from The best!! When I saw the new colors I knew this lilac had to be mine. I own several flasks but this is my first tumbler. Obsessed! Keeps ice for almost 3 full days. Rated 5 out of 5 by Jax27 from Love the color! I bought this a month ago and have used it almost everyday since! It keeps cold things cold and hot things hot all day. I purchased the lid with the straw to use with this and am so happy with it. Rated 5 out of 5 by Aleee from Hot coffee all morning!!!! I hate reusable cups and love how it holds such a large amount of liquid!!! No more reusable cups!! Rated 5 out of 5 by Kaylee20 from I'm in love! I bought this about a month ago and I'm in love. It's the perfect size and I love the color. The only thing is the color was a little different from the pictures, but I think the color is still great! Rated 5 out of 5 by MelaineL from Perfect at home cup!!! I have fallen in love with these tumblers! The size is perfect and keeps my water ice cold all day and night. I don’t need to refill as frequently bc of its size. I’m actually slowly replacing all our glass cups for hydroflask tumblers in all sizes. Rated 5 out of 5 by GlorWormEMC from I like the size and the large volume it holds I bought this for my desk at work and it keeps my coffee at the temperature I like. Rated 5 out of 5 by Ashley444 from ❤️ It’s big enough to stay hydrated but small enough to fit in a standard cup holder. Rated 5 out of 5 by Pick8 from Can't Miss I bought this over a month ago and enjoy using it. Even though I ordered a larger size than I needed!! Rated 5 out of 5 by Mary2200 from Great cup! I love my HydroFlasks! These cups keep my water very cold! They are exactly as advertised! Great purchase. Also, the lid./straw combo are wonderful! Rated 5 out of 5 by Alex856 from Sent it to the east coast I actually bought this for a friend of mine who lives on the east coast. He never heard of the line. I live in Cali and have family in Oregon. They own a few different hydro flasks and they love them. I got this style for my friend because he drinks water during the night, and prefers ice cold water. I instantly thought of this brand. I bought it and sent it to him. He rants and raves about it. He’s amazed how long his beverages stay cold. Rated 5 out of 5 by Caia from Keeps coffee hot Bought this for my hubs who was spending triple digits on coffee from a DINER every month. Now he can bring good coffee with him from home that lasts him half the day and costs a fraction of what he was previously spending (after the initial investment on a few of these beauties..). Now I need to get some for me to stay hydrated while I BF our newborn. Great colors, sturdy construction, well insulated. Definitely recommend. Are the tumblers and water bottles dishwasher safe? Does this do well for soda and holding the carbonation ? Yes, I use mine for soda and have no problems with it. Are the tumblers dishwasher safe? No, we do not recommend putting our flasks in the dishwasher. Tumblers / lids = dishwasher safe? The lids are top rack dishwasher safe. The flask is not dishwasher safe. What is the country of origin for the 32 oz tumbler? Thanks. 32 oz. Tumbler. &nbsp;&nbsp;Any recommendations for making the lid easier to remove. &nbsp;Is there an approved lubricant for the gasket? How long will a coffee stay warm in a tumbler because the lid cannot completely close? Hot would be up to 6 hours. Do you offer engraving on your products?